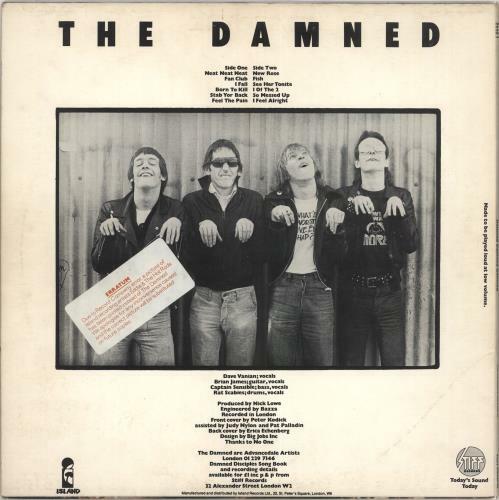 THE DAMNED Damned Damned Damned (Rare original 1977 UK Stiff label 12-track vinyl LP with etched A1/B1 matrices as well as 'A Porky Prime Cut' & 'The Sound Is In The Music' scratched into the dead wax, complete with the ultra rare picture sleeve with misprinted 'Eddie & The Hot Rods' image on the back with the original red Erratum sticker over the image. The sleeve has just a light sheen to the front, probably due to the original shrinkwrap and shallow creasing to the bottom left corner, with a little discolouration to the reverse, with no splits or paper loss and the spine text clear & legible; the vinyl has just a little cosmetic marking left by the original poly-lined inner, which has no real impact on play and very little sign of actual turntable use, leaving it Excellent. 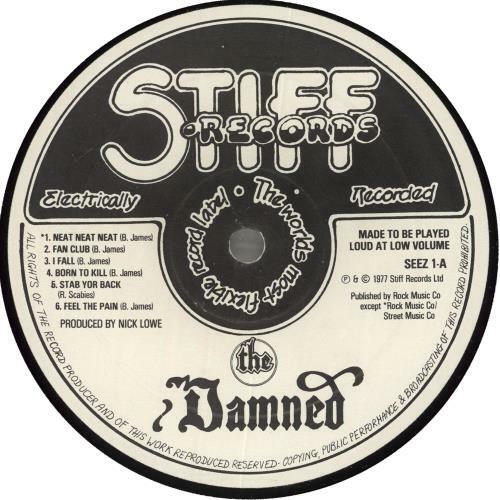 A great copy of this piece of Punk history SEEZ1).